Characteristics: Double glazing (35mm) with thermal and acoustic insulation properties, aluminum frames, use of parking area, no floor track guide., Insulation with brushes and rubber seals. Basic dimensions: Lower and upper aluminum profiles 105mm, aluminum track with size of 60x53mm or 75x72mm (heavy-type), otal intermediate aluminum frame width: 52mm. The F4 is an advanced heavy-duty glazed folding door system, designed for spaces with high aesthetic and practical demands. It consists of panes bearing double glass-boards placed within an aluminum frame for additional robustness, durability and insulation in more demanding and challenging environments. It is therefore ideal where such attributes are desirable. Its vertical profiles have been designed to fit together, bearing male and female sections, so that they perfectly couple with each other, covering all gaps very effectively. Elastic gaskets are also employed, completely sealing even the smallest gaps, for an entirely watertight and airtight result. On its horizontal profiles, water tightness is achieved by using special synthetic brushes, while, around the edges, where the construction meets the surrounding walls on the sides, the F4 employs an additional aluminum profile for even better insulation and a more aesthetically integrated touch. Apart from the floor latches this system uses, each pane is secured and locked with recessed locks found on the vertical profile about one-meter high up from the floor, which is one of the most important features of this model. Any pane can also be turned into an opening/divertible door, functioning as an entrance, once a roof spring mechanism is fit in. Such entrances can be both single and double winged. Depending on the project’s size, the right type of aluminum track guide needs to be selected, for the suspension and movement of the panes: these are either 60x53(mm) or, the heavy-type, 75x72(mm) in size. For the smaller track guide, pane size can reach up to 100cm in width and 260cm in height – with maximum pane weight of 100kg - and the heavy-type, respectively, 120cm in width and 320cm in height – with maximum pane weight of 150kg. Every pane bears double 35mm glazing, with thermal and acoustic insulation characteristics. The double glazing can also be modified to accommodate blinds, for a more discreet and integrated result when protection from direct sunlight or privacy is desirable. Finally, a classic but the same time contemporary design suggestion for this system is the place horizontal profiles along the pane’s height, to create the impression of “split windows” – as the have come to be known in design terms. There are countless applications for this type of system, from restaurants and cafeterias to perimetric patio enclosures, spaces close to busy streets, hotels, night clubs, offices and many others. Due to their double glazing and sturdy aluminum frames, the F4 folding door system is ideal for particularly demanding environments. Protection from weather conditions: Thanks to their double glazing, thermal leakage is significantly reduced, increasing energy savings. Design Flexibility: Absolute flexibility both in terms of how and where panes are parked, as well as the number and dimensions of panes. 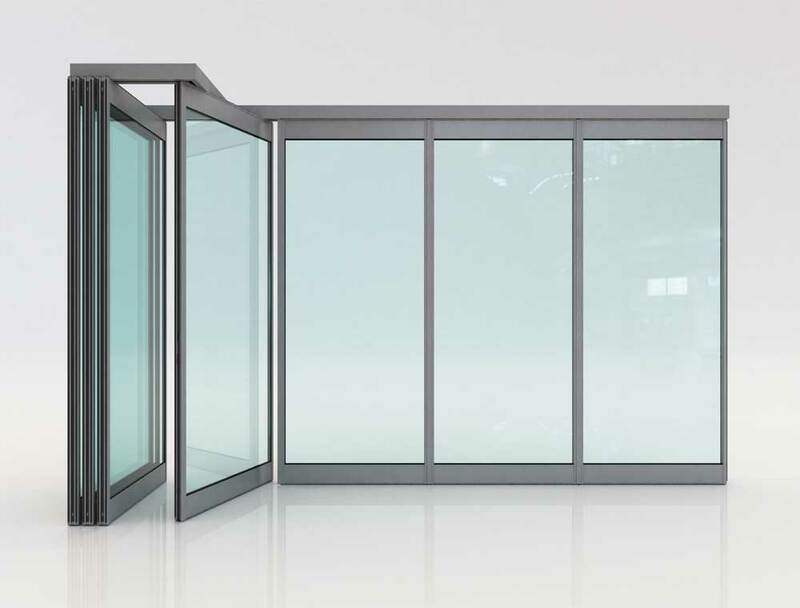 Elegant aesthetics: The F4 is a very sturdy, high-performance folding door system, but in spite of its requirements, it was designed to look very elegant and pleasing-to-the eye.